The term "hydrosolidarity" describes an increasingly integrated approach to managing water resources that relies heavily on participation and coordination among community stakeholders , water-related management agencies, and local, state, and national governments. A fundamental goal of hydrosolidarity is the cooperative, unified management of shared water resources, whether at the national or the international level. Although hydrosolidarity can be applied at various government levels, the principle is more commonly applied in an international setting. For example, hydrosolidarity was the primary topic discussed at a 1999 seminar in Stockholm, Sweden, sponsored by the Stockholm International Water Institute and the International Water Resources Association. Hydrosolidarity is perhaps best understood in contrast to hydrosovereignty and other aspects of traditional water resources management. Hydrosovereignty refers to the sovereign control exerted by autonomous nations with respect to the use and management of their water resources. In a national context, states, individual landowners, or other entities also may emphasize the right to use water within their property in any way they see fit. Sovereignty is emphasized for water just as it is for land and other natural resources that are bound to a particular place; however, problems arise because water flows downhill, potentially affecting other individuals or groups and crossing political boundaries. Because water flows downgradient across the landscape, the relationship between upstream and downstream entities and the connection between terrestrial (land-based) conditions and water resources must be considered for sound water management. These interconnections require coordinated management efforts within river systems ( watersheds ), not only for the efficient use and conservation of the resource, but also to avoid or resolve water-related conflicts. Thus, hydrosolidarity emphasizes consideration of how water management activities affects others within a river basin, which in turn necessitates consideration of the diverse values associated with water resources: for example, drinking water, hydropower , and aesthetic or recreational values . Traditionally, water management has focused on water quantity and allocation . Attention is often placed on the allocation of "blue water" rather than on pollution problems, the maintenance of so-called "ecosystem services" supported by water ("green water" issues), and the health of aquatic ecosystems more generally. (See sidebar on page 201.) Furthermore, little integration of water quantity and quality management has occurred. Given that water quality is inherently linked to human consumption of water, greater implementation of multiple-objective, integrated management is a necessary component of hydrosolidarity. Interrelationships are ever-present in water sciences and management. As suggested previously, linkages exist between water quality and quantity, land and water resources, upstream and downstream entities, and various components of the hydrologic cycle. As such, holistic assessments of water resources and related decisions or projects are necessary for managing the resource. Water shortages are among the water management problems that spotlight the need for hydrosolidarity, both at national and international levels. 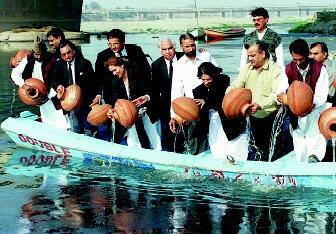 These officials from Pakistan symbolically empty pitchers into the Ravi River during a prolonged dry spell in 2001. In many cases, integrated, cooperative water management can help reduce negative impacts from natural or human-induced inequities in water distribution. Many academic disciplines and specialists inform water resource management, including but not limited to hydrologists, biologists, engineers, economists, lawyers, political scientists, geographers, and sociologists. As such, multidisciplinary and interdisciplinary research is critical to understand the complexities and interrelationships within water management. Collaboration of academics and nonacademics around water science also can foster communication about the resource. Institutional mechanisms, such as upstream–downstream partnerships and river basin commissions, are critical for coordinated water-related research and management, avoiding and mitigating water conflicts, and achieving hydrosolidarity more generally. The broad purpose of such institutions is capacity-building, which includes financing activities, fostering communication among various entities, and establishing procedures for coping with conflicts, natural hazards, and other problems that may arise. International treaties and other agreements are also important mechanisms for promoting integrated, cooperative management of water resources. Thousands of water agreements have been signed internationally and often address procedures for water allocation, information exchange, and conflict resolution mechanisms. More generally, national and international water law influence water use and management and thus are an important element of achieving hydrosolidarity. The UN Convention on the Non-Navigational Uses of International Watercourses, adopted by the UN General Assembly in 1997, focuses on many issues that are critical components of hydrosolidarity. The convention includes the principle of equitable and reasonable use of water resources, obligation not to cause significant harm, and a commitment to notify affected parties about planned projects. The convention further emphasizes all-party participation, transparency of information, and mechanisms for conflict resolution. All these issues are common topics among water resource professionals and are regularly addressed by water institutions and agreements. Traditional approaches to water management have been piecemeal and fragmented because of a lack of coordination among stakeholders, management agencies, and political entities sharing a watershed or river basin. As the international community shifts toward hydrosolidarity, several changes and considerations will be necessary, including those mentioned previously. Hydrosolidarity is indeed worthy of national and international attention, as it seeks an equitable distribution of water resources and minimization of negative impacts on humans and the environment through unified, cooperative management of the resource. SEE ALSO Balancing Diverse Interests ; Conflict and Water ; Hydropolitics ; Integrated Water Resources Management ; International Cooperation ; Law, International Water ; River Basin Planning ; Transboundary Water Treaties . International Water Resources Association. "Towards Hydrosolidarity." Water International 25, no. 2 (Special Issue, 2000). The phrase "blue water" refers to liquid water used for municipal and industrial consumption, irrigation, hydropower, navigation, and so on, whereas "green water" refers to evapotranspiration of water within ecosystems. Blue water has more commonly been the focus of water science and management because of its visibility and direct relationship to humans. However, emphasis must be placed on green water given its vital importance to ecosystem services and the interconnections between green and blue water within hydrologic systems. For example, green water is critical to plant production, which humans rely on for food, fiber, pasture, fuel, and timber. Because the amount of water in the hydrologic cycle is relatively fixed, blue water decreases as green water increases, thus creating a need to consider the two in tandem.